Each year, over 94% of eligible Grand Rapids Christian students return. Our admissions team has worked diligently to make the yearly re-enrollment process as painless as possible, but we want to make things even easier for GRCS families! We also need time to plan in order to hire and retain the very best teachers and utilize our resources more effectively. That’s why we’re launching Continuous Enrollment. Continuous Enrollment Contacts are now available to current families. I have no plans to change schools—and almost everybody comes back every year anyway. Can’t I just stay at Grand Rapids Christian until I notify the school otherwise? So what will February 2019 look like? After this year, what will the “Re-enrollment Period” Look Like? Will I be notified of the auto-withdrawal from my account? How do we notify the school if we are not planning to return the following year? What’s the penalty if I break this contract? But what about unique circumstances? I’m planning on keeping my kids at GRCS. What if God has other plans for my family? What if my child needs to repeat a grade? What does this mean for new families? What is the process for updating my information after I am continuously enrolled? Who do I speak to if I have questions or concerns? Every Spring, our admissions staff sent a re-enrollment agreement to each family. Parent(s) were expected to sign and return this by the end of April if they were planning to re-enroll their child(ren) for the next school year. For planning and budgeting purposes, we need to know how many students to plan for on the first day of school. Did you know that many of our classes are at or near capacity? Our recent growth requires us to plan for adding future classes, hiring new teachers, and improving our facilities. Leadership plans diligently to ensure that we’re prepared to fulfill our mission with excellence every year. Until GRCS families “sign on the line” that they’re coming back each year, we can’t make solid plans for staffing, programs, class offerings, materials, curriculum, and facility usage. We take the stewardship of tuition dollars entrusted to us very seriously. We want to invest these tuition dollars wisely so that we can provide the best education possible for Grand Rapids Christian students. Great idea! Up until this point, re-enrollment has been an “opt-in” program. Annually, we have asked every family, “Are you coming back?” In a sense, we’ve been requiring the vast majority of families to go through this process when, in actuality, only a few families decide not to return. Last year, for instance, we retained over 94% of our student body. So everyone had to go through re-enrollment paperwork for the sake of the small 6% that, for one reason or another, left our GRCS community. By signing your new Continuous Enrollment contract, you will be flipping that script. Rather than an ‘opt-IN’ process each February, our annual re-enrollment period will become an ‘Opt-OUT’ opportunity. Just let us know if you are not planning to return next year. For the majority of families, if you’re coming back after signing your “Continuous Enrollment Contract,” you won’t have to do a thing! January 2019 marks the launch of Continuous Enrollment. In place of the old re-enrollment agreement, current families will sign the new Continuous Enrollment Contract. All contracts will be due by February 20, 2019. In subsequent years following the 2019-2020 school year, notifications to disenroll (“Opt Out”) will need to be submitted by February 20. We look forward to serving GRCS families in this way and making this process easier and more convenient! Instead of sending out re-enrollment agreements to each family this Spring, we will email the new “Continuous Enrollment” contracts to each family in January. 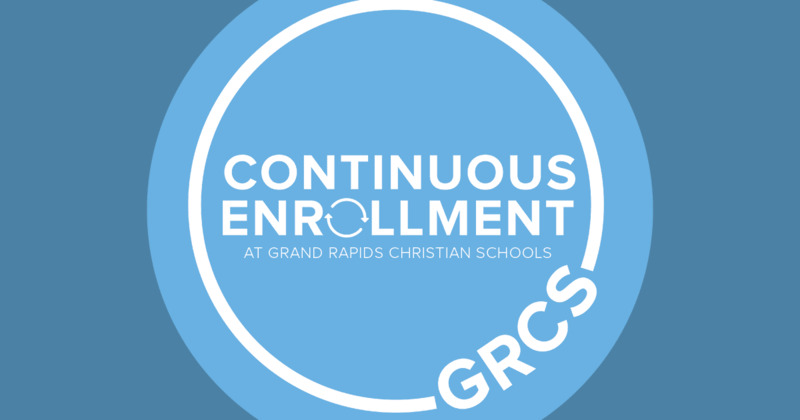 Once you re-enroll your child at Grand Rapids Christian by signing it, you will not have to sign another enrollment contract during your child’s time at GRCS. This means their spot in their class will be secured until graduation. This new contract will be due by February 20, 2019. In other words, after you sign your new Continuous Enrollment contract in early 2019, you’ll be part of our community until you tell us otherwise. If your plans change, then you’ll simply let us know during the ‘Opt-Out’ period each spring for the following school year. After we roll out the Continuous Enrollment program in January 2019, the typical re-enrollment process every February will simply be a communication reminder from the school informing the families that might be thinking about leaving our school to notify us by February 20. It will be an opportunity to ‘opt out’ of enrollment for the following year. If last year is any indication, this means that over 90% of GRCS families will have the convenience of ignoring this message and doing absolutely nothing! Yes, you will receive an email through SMART approximately seven days prior to the automated withdrawal for any tuition or fees charged to your account. SMART allows you the option to have the amount deducted from your bank account or pay by credit card. We have created an easy one-page opt-out form for your use. To notify the school that your child will not be returning in the fall, simply request this form by emailing admissions@grcs.org and submit it by the February 20 opt-out deadline. Again, Grand Rapids Christian Schools makes decisions related to hiring staff, classes, and purchasing additional curriculum and materials based on anticipated enrollment. Your future plans influence our current decisions. For that reason, if you notify Grand Rapids Christian Schools of your decision to opt out of your contract for the following school year by February 20 of the current year, there is no penalty. However, if you notify us of your child’s withdrawal after the opt out date, Grand Rapids Christian Schools will charge your Smart Tuition account one month of the upcoming year’s tuition. We understand that life takes other turns than what we had imagined, so we’ve built flexibility into this contract. Prior to the annual Opt-Out date of February 20, you can notify GRCS that you’re not planning to return next year, without any penalty or difficulty, by completing the Opt-out form. After February 20, if you decide to leave GRCS for personal reasons, you will be responsible for one month of the upcoming year’s tuition. This is because Grand Rapids Christian must hire teachers and purchase classroom materials for your child beginning in late spring, and we rely closely on the enrollment numbers to make informed decisions. Moving/Relocation 25+ miles from Grand Rapids Christian Schools. Educational needs for the student that can no longer be met at Grand Rapids Christian Schools as determined by the GRCS Student Support Services teams. Dis-enrollment at the request of Grand Rapids Christian Schools. Other circumstances as approved by the Board of Trustees. Occasionally, especially in preschool and kindergarten, students will need an additional year at a grade level. These discussions will occur between you and the teacher. If a child will remain in the same grade-level for another academic year, it is just a matter of a change in Synergy/ParentVue on the school’s side and will require no changes to enrollment on your part. Continuous Enrollment is a simple one-time process. Once you sign your Continuous Enrollment Contract, you’ll never have to deal with re-enrollment again. Again, our motto is “set it and forget it”— sign one Continuous Enrollment contract and you are done for the rest of your child’s schooling at Grand Rapids Christian. You will be part of the GRCS community until you tell us otherwise, and your child’s spot in their class will be secure until graduation. In the event that things do change, you’ll have until February 20 every year to simply notify the school and face absolutely no penalty. New families will sign the Continuous Enrollment contract at the time they enroll their child(ren). This new contract replaces the former enrollment contract, which was previously used for all families. Simplicity. Continuous Enrollment eliminates the annual re-enrollment process and paperwork involved. Guaranteed placement. With increasing enrollment, we are at or near capacity in many of our grades. Placement in next year’s class is an increasingly sought after spot. By enrolling now, you will be securing your child’s spot in his/ her class until graduation. Parents may log into and update their information in ParentVue at any time during the year, and may also contact their school office with any additional updates. Each spring, we will ask parents to review and verify additional information online as well as update information that requires annual submission (for example, requesting busing and student driver authorization for high school students). Parents will receive an email in April with a link to this verification process. For questions about Continuous Enrollment, please connect with Amy Orr at AOrr@grcs.org or 616-574-6007.